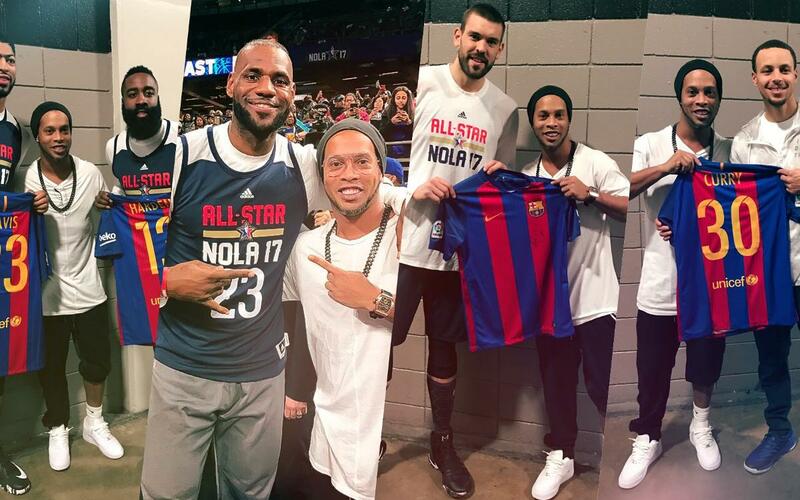 Ex-Barça star Ronaldinho, who became an FC Barcelona ambassador a few weeks ago, is in New Orleans to represent the Club in the NBA All-Star weekend which brings together the tournament’s best players for a three-day event. The Brazilian attended Friday’s All-Star Celebrity Game as well as watching the BBVA Compass Rising Stars Challenge between a rest of the world team, which included ex-blaugrana Álex Abrines, and a young USA team. On Saturday Ronaldinho met most of the players who will be playing in the much-anticipated match between the Eastern Conference and the Western Conference on Sunday. Ronaldinho was able to present various players with Barça shirts, including Stephen Curry, Kevin Durant and Klay Thompson of the Golden State Warriors; James Harden of the Houston Rockets; Anthony Davis of the New Orleans Pelicans and Lebron James of the Cleveland Cavaliers, among others. One of the most heart-warming moments of the day was when the ex-blaugrana Marc Gasol saw Ronaldinho and the two exchanged an embrace on the court. After the training session, the Brazilian gave the Milwaukee Bucks’ Giannis Antetokounmpo a Barça shirt and the Greek player didn’t hesitate to give him his training shirt in exchange. Both Gasol and Antetokounmpo are big football fans which was clear to see in their meetings with Ronaldinho. This morning, the Club ambassador will enjoy the All-Star game which will bring 2017’s All Star weekend to a close. Following this weekend the teams head into the final straight looking to qualify for the play-offs. Once the Brazilian has finished with his commitments in New Orleans he will travel to Haikou in China to accompany the President, Josep Maria Bartomeu, in the signing of a deal with MissionHills. This agreement will guarantee FC Barcelona’s FCBEscola project seven training pitches with capacity for 1,000 children, a Museum and a Megastore in China.